The Initial Top Arch: Before the f-holes are drawn and cut, the top arch is finished as far as possible. After the fs are cut, it will be necessary to adjust the arch, especially around the fs. Starting the F-Holes: The f-holes are positioned relative to points on the outline and to the centerline, and traced from a plastic template. Checking the Arch: The shadow cast by a straightedge gives a visual check for problems in the arch. This particular area is finished, and won't need to be changed. Drilling the F-Holes: The eyes (round ends) of the f-holes are drilled with a special bit while the top is still full thickness, for support. 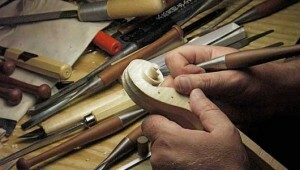 In the classical Cremonese style, they're drilled perpendicular to the arching rather than straight down into the top. Rough Graduation of Top: After the eyes have been drilled, the top is graduated just thin enough to make sawing out the remaining part of the f possible. From this point onward, I switch back and forth between cutting the fs, graduation, and refining the arching. The fs aren't cut in a single operation because everything—arch, graduation, and f-holes—needs to work together. Sawing the F-Hole: I use a jeweler's saw with a special wood-cutting blade to saw closely to the line I drew earlier. Refining the F-Hole Shape: The shape of the f-hole is cut more accurately using a small, sharp knife. Refining the Arch: As the f-holes approach their final shape, the arching around them is adjusted to make them stand out more from the surrounding surface. Here, the lower wing is hollowed and lowered. Marking the Final Graduation: After the f-holes and top arch have been nearly completed, the top is graduated by punching marking holes and planing and scraping until the holes are gone, as was done to the back. Starting the Bass Bar: The bass bar comes next. I mark the position of the bar inside the top and prepare a piece of spruce to the proper size. The marks on the side of the bar are for measuring the height later and for clamp placement when gluing. The fit of the bar to the top must be absolutely perfect. Gluing in the Bass Bar: Notice that clamps alternate sides: when the top is wet, an imbalance of clamps could bend the top, resulting in a ripple. Using too much water to wash away excess glue, or poorly fitting the bar would also warp the top. The Finished Bar: After the glue is dry, the bar is shaped to height and cross-section. Though the bar looks like an interesting, undulating shape, that's only because it follows the arch of the top. If it were pressed out on a flat table, it would look more like a long triangle.